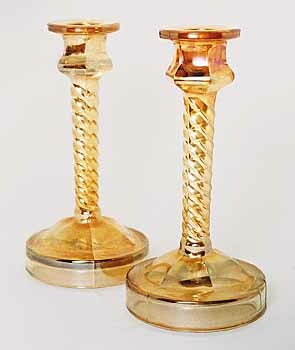 Updated 1/5/2018 These marigold candlesticks are 8 to 8 1/2 inches tall with a 4-inch round hollow base. They're listed in Great American Glass of the Roaring 20s as Jeannette's #5198. Auction prices in 2010 were $10, $15, and $25 a pair. In 2015, a pair sold for $10 as did another pair in 2016. In 2017, a pair in marigold brought $5.